….stuffed, grilled, baked, pickled, or fried tomatoes? Share your recipes with our readers! After you list ingredients, then share instructions. You can even send along a picture if you like! Thank you for sharing. Bon appetit! Have a Favorite Tomato Recipe? Do you have a favorite fresh tomato recipe or a good way to use extra fresh tomatoes? 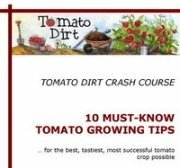 Share your recipe with Tomato Dirt readers. Be sure to include a list of ingredients followed by steps to take. Enter a title, such as "Homemade Tomato Soup Recipe"
TIP: list ingredients first. Then make a list of steps to take. Get more ideas on our Fresh Tomato Recipes Pinterest Board.